Rooted in a sixty-year history of academic excellence, Léman Manhattan's educational philosophy of globally minded learning is inspired by our namesake sister school Collège du Léman, founded in 1960 in Versoix, Switzerland. With a longstanding reputation as one of the world's most prestigious international day and boarding schools, Collège du Léman enrolls nearly 2,000 students from 100 nationalities on its sprawling and picturesque campus on the shores of Lake Geneva. 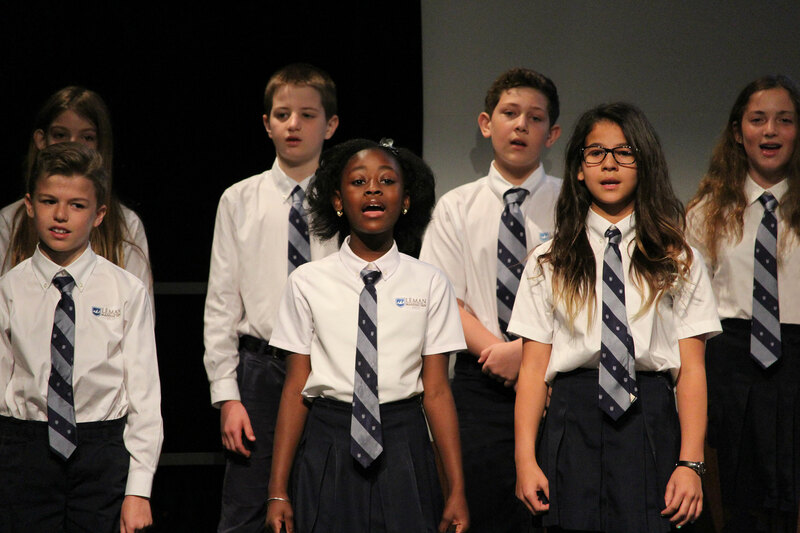 Léman Manhattan was established in the heart of downtown in 2005 to bring a new vision to New York City's K-12 independent school landscape — one defined by a cross-cultural global context, personalized learning, and innovation. 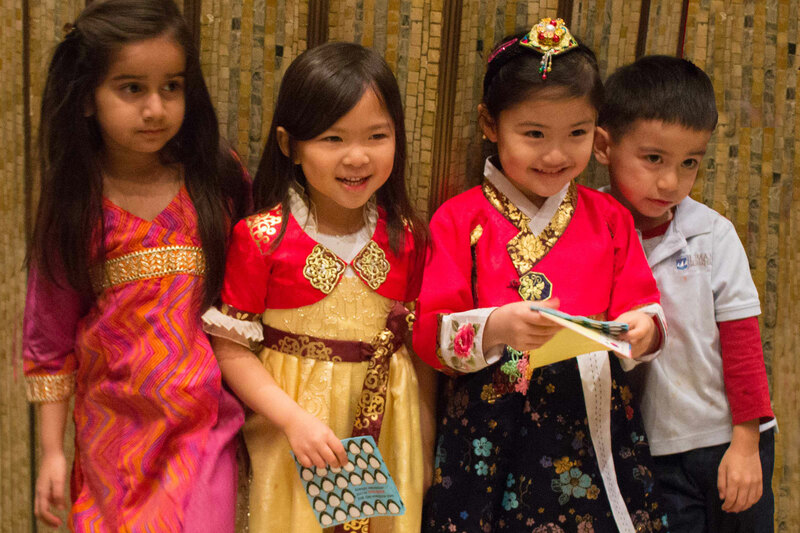 Throughout our history, we have built a strong school community recognized not only for exceptional academic outcomes, teaching excellence, and international diversity, but a genuine warmth felt from the moment you step through our front door. Our first day of school each September ends with the moving and celebratory Opening Ceremonies. With great excitement, students, faculty, and staff gather in the historic Broad Street Ballroom to honor new beginnings. 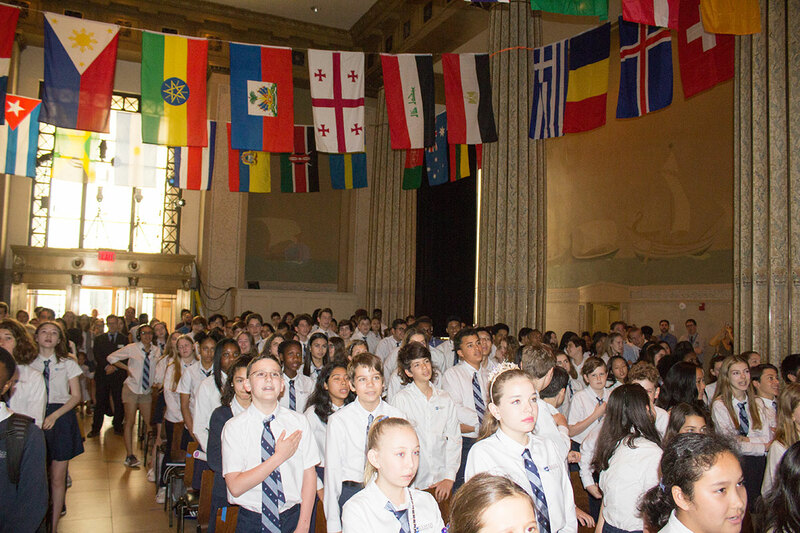 Juniors lead a national flag processional met with cheers for our community's many countries of origin. Assuming their role as student leaders, Seniors hold the hands of Kindergarteners to usher them into the Ballroom, signifying the Léman K-12 educational journey. After performances by talented student musicians and a rousing edition of Alma Mater, this all-school assembly concludes with the Ringing of the Bells, where a first-year student, parent, and faculty member are selected to welcome all to the new academic year. Léman's pillar of Internationalism is the theme of the annual International Festival, hosted each January by the Léman Community Association in our grand Ballroom. Families volunteer to represent their countries of origin and students, parents, and faculty take a “world tour” through nations from Australia to Trinidad and Tobago, where they are treated to offerings of native food, costumes, performances, and culture. We are all enriched by the diversity of the Léman community celebrated at the International Festival. Outstanding seniors are honored each Spring for their academic achievements and contributions to the Léman community at the annual Senior Awards Ceremony. Our exceptional students are awarded for their accomplishments in disciplines ranging from Biology and American History to Art and Athletics by proud teachers and advisors. In addition, three distinguished awards are presented to student leaders who have made notable contributions to Léman: the Léman Leadership Award, the Léman Faculty Award, and the Léman Head's Award. As a school that serves children ages 16 months to Grade 12, one of the most exciting times in a Léman student's journey is the transition from one academic division to the next. Fifth and Eighth Graders celebrate this milestone with the traditional Moving Up Ceremonies. 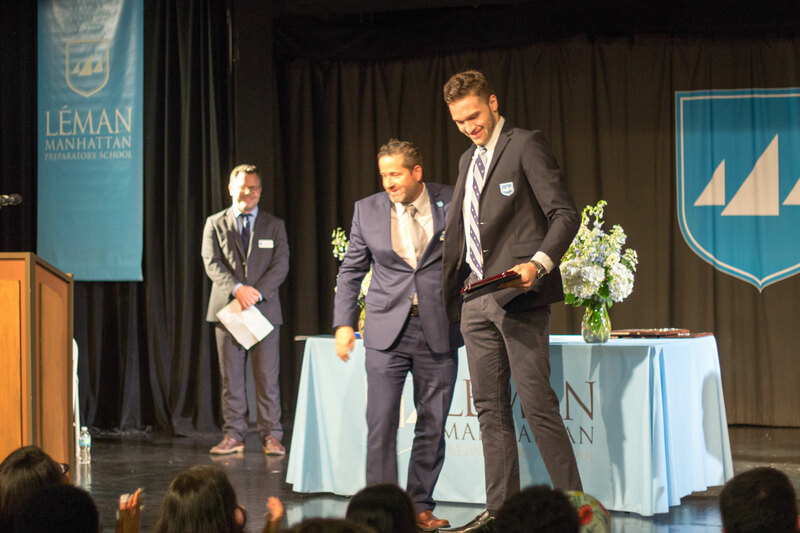 This formal assembly honors students for their achievements as leaders in their division and ushers them into the next chapter of their educational growth as Middle and High School students at Léman. Léman celebrates the last day of the school year with the traditional Closing Ceremonies. At this all-school event, students, faculty, and staff gather together in the historic Broad Street Ballroom to reflect on shared accomplishments as a school and as individual learners. The room is decorated with the flags of nations that represent our international community and student performers grace the room with their talent. After closing remarks from the outgoing Student Body President and Head of School, we conclude this special assembly with the annual tradition of Ringing of the Bells, which brings together a student, parent, and staff member to represent Léman's pillar of Partnership. 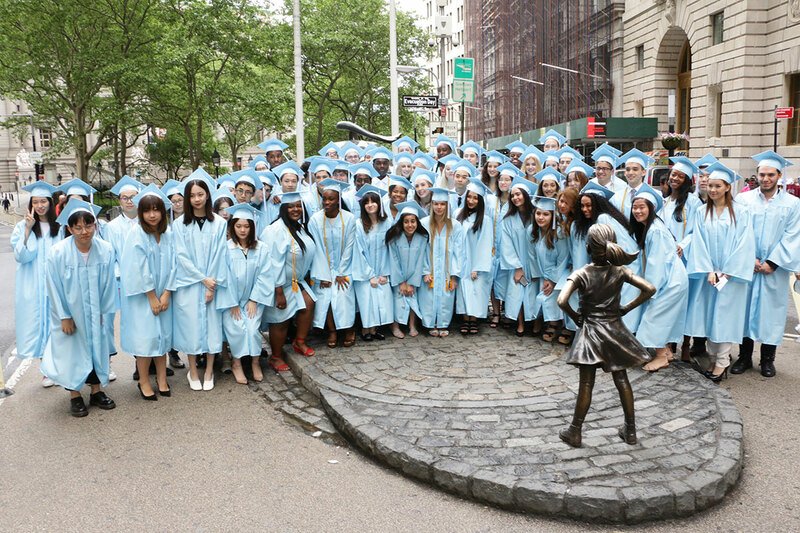 Prior to their walk across the stage of the historic Broad Street Ballroom, each Léman graduating class takes a traditional "graduation walk" around the streets of the Financial District, our home in Downtown Manhattan. Students reflect on their accomplishments and celebrate the end of their high school years as they pose for graduation photos in front of the historic landmarks that we are so lucky to call our neighbors, including the Wall Street Bull, the New York Stock Exchange, and Federal Hall.